The buyout firm’s largest single pool of capital, at $18.5 bln, coincides with fresh records across the industry. 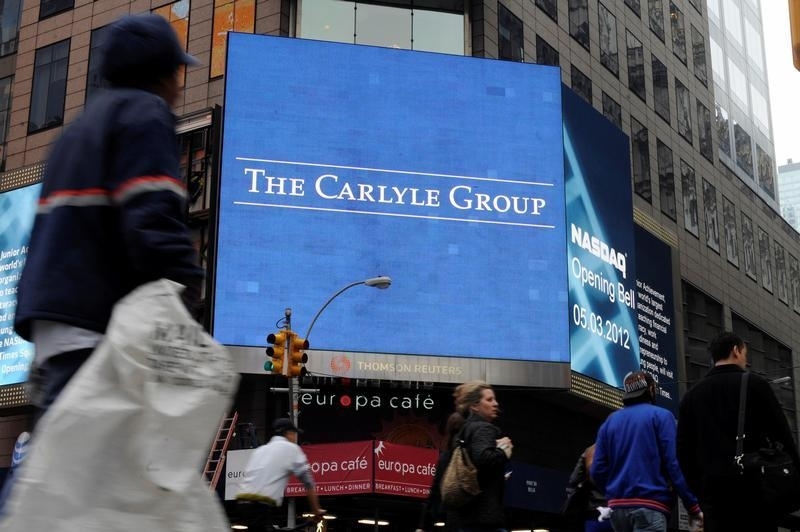 It may get harder for Carlyle and its ilk to deliver high returns. With shareholders prizing fees over investment profit, though, taking more money is a no-brainer. Passersby walk in front of video monitors announcing the Carlyle Group's listing on the NASDAQ market site in New York's Times Square after the opening bell for trading, U.S. May 3, 2012. Carlyle said on July 30 it had closed the largest buyout fund in the firm’s history, at $18.5 billion, higher than its initial $15 billion target. The U.S. fund, Carlyle Partners VII, will both take control of and make minority investments in five broad industries: aerospace, defense and government services; consumer and retail; healthcare; industrial and transportation; and technology, media and telecommunications. The firm’s last U.S. buyout fund was $13 billion and began investing in 2014.